Notes: WEST’S BUILDINGS, BALTIMORE, MD., consisted of a block of six warehouses each having three stories and an attic. The brick walls had no interior finish, but as they were thirty-four inches thick moisture was seldom observed to penetrate them. These houses were each 24 feet wide, but their depth varied from 107 to 124 feet. The ceilings were too low for the area of the rooms, being 11 feet high on the first floor, 9 feet 6 inches on the second and 9 feet and 2 inches on the third floor. The first floor was unsuitable for ward use, — it was flagged, and deficient in light and ventilation; it contained the offices, kitchens, bakery, dining-room, laundry, store-rooms, guard’s quarters and a few small rooms for employees. The twelve rooms on the second and third stories were used as wards. 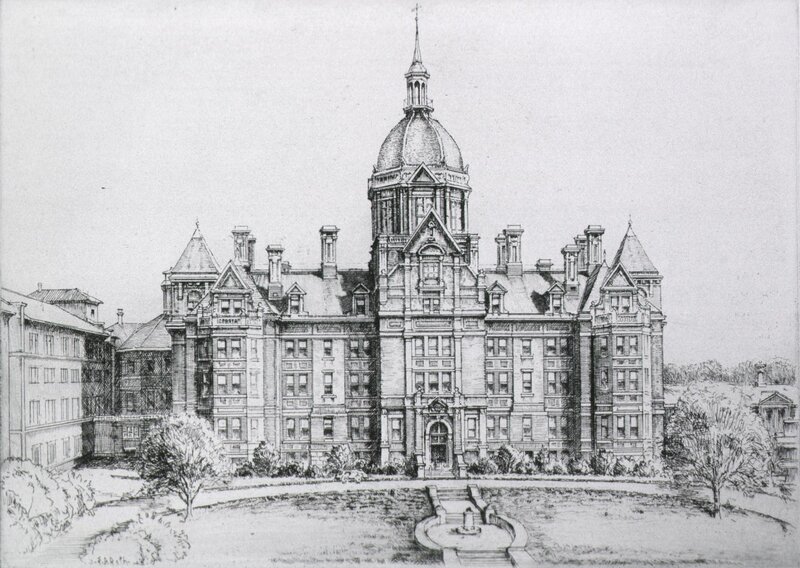 Their dimensions corresponded with those of the several buildings; they contained from 32 to 39 beds each, giving a hospital capacity of 400 beds with 800 cubic feet of air per bed. The wards of each floor communicated freely with each other by doorways in the party walls. The four exterior wards, two on each floor, had good light and ventilation by 10 windows each, 4 along the length of each ward and 3 at each end; but the eight interior wards on each story, were lighted and ventilated only by the end windows. The wards were reached by interior stairways having no direct communication with the external air. To improve the ventilation wooden shafts were extended from the ceilings of the various wards to the ridge of the roof, but no current was established through them, as they were too narrow and turned twice almost at right angles in their course. The wards were unequally heated by coal-stoves. There were four bath-rooms and water closets, two on each floor, or one to every three wards, but as each closet contained only one seat a majority of the patients had to make use of the sinks in the yard. The water-closets were fitted with urinals, but as these were untrapped they emitted an ammoniacal vapor. The attics were used as store- and knapsack-rooms and as quarters for nurses. The officer of the day had a room on the flagged first floor, but no other officer had quarters in the building.